The String Project Los Angeles difference: The Repertoire. We know the job of any good teacher is to light the spark of passion in each student. As music teachers, we believe this starts by knowing what is on our students ipods and helping them connect to their instruments by playing music they are already excited about. In addition to contemporary repertoire, String Project instructors offer a well rounded approach which features Hip hop, Latin, Brazilian, as well as Rock, Jazz, Funk, and Blues. We believe each one of these genres has the power to inspire and illuminate the mind of young musicians. Rhythm and Groove – At SPLA, each class learns the basics of creating grooves on their instruments. SPLA’s music and movement (Eurythmics) curriculum help Students also develop their inner pulse and sight reading skills. Singer Songwriter Skills – Every SPLA class gives students the tools they need to write their own songs and sit in with a band while deepening their appreciation and understanding of music in general. SPLA students learn to read guitar chord charts, create their own arrangements, and more! Sing and Play/Ear training – Our unique ear training curriculum helps students develop the “Ear to Hand Connection” that is at the core of great musicianship. Improvisation – At SPLA Improvisation is at the heart of what we do. 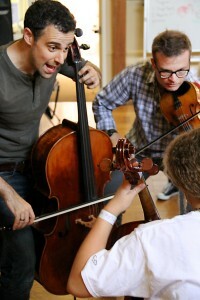 Our unique curriculum developed by SPLA Cofounder Jacob Szekely helps students delve deeply into the language of music. All SPLA students will learn the basics of blues/rock/jazz/fiddle and beyond within their first year of the program. Ensemble Performance – We believe that the most important role of any teacher is to light the spark of passion in each and every student. This is why we try to focus on studying contemporary pieces of music that students are already listening to on their IPODS while exposing them to many different musical styles from all over the world. SPLA is auditioning now for the Alternative String Group Fall 2016/17 Program through June 20th 2016! Fill out the form here for your audition and to find out more about the camp from SPLA Creative Director Jacob Szekely during your audition.